Here is a little gem just a few feet of Forest Road #88. This trail was built as a memorial to KC Langfield, an old-time District Ranger. And the falls was named after him. The trail leaves the parking area and parallels Mosquito Creek as it drops on a long switchback to a point near the base of the falls where you can sit and enjoy the beauty. A monument is along the trail in memory of Mr. Langfield. Bear left and continue on SR141 for another 1.7 miles where you will come to Trout Creek Road, which is also Forest Road 88 on your right. Turn right onto FR88 and follow it north-northwest for about 3.9 miles and you will come to Forest Road 010. Bear to the left and stay on FR88. In about 8.6 miles you will come to a series of intersections, but just continue on FR88 as it bends to the right and crosses over Mosquito Creek. You will pass FR8841 on your left, then FR8851, also on your left. Just continue ahead on FR88. 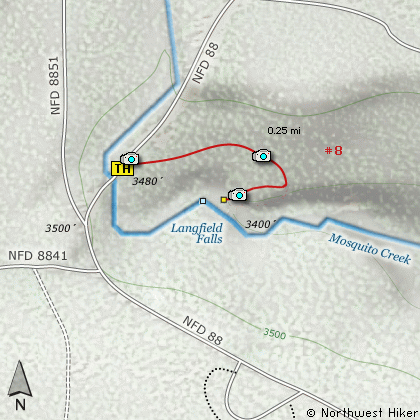 The trailhead and parking area for Langfield falls will be on your right.